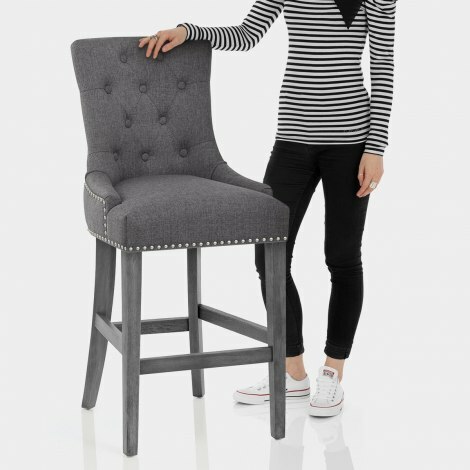 The Etienne Bar Stool Charcoal Fabric is expertly crafted with style and practicality in mind. Upgrading a traditional fixed height design with sumptuous modern details, the Etienne Bar Stool will bring comfort, elegance, and class to your bar area. Comfort is promised with the sprung and belted seat and padding beneath the stylish charcoal fabric upholstery. 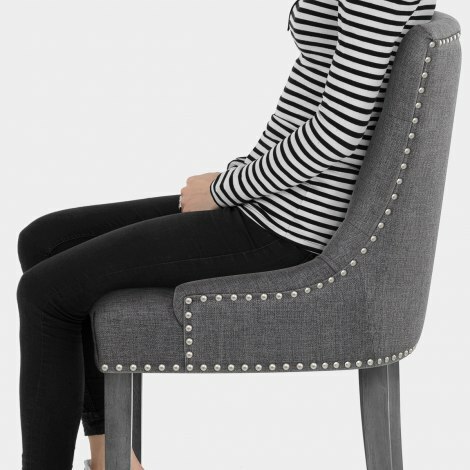 The backrest meets the seat with a wraparound design for an encompassing feel, and is decorated with classic quilted button detailing, while studs adorn the rear. Beneath the seat is a sturdy solid wood fixed height frame formed of four legs and a bracing bar footrest. Giving the stool its contemporary flair is the frames grey finish, which complements the seat beautifully. Each leg is complete with a protective plug to ensure your floors are taken care of. "Very comfortable to sit on for hours!" We recently purchased these beautiful chairs. The delivery was very prompt. The chairs were easy to assemble. They have a lovely finish and are very comfortable to sit on for hours! Great product.